Republican U.S. Sen. Kelly Ayotte of New Hampshire delivered her farewell remarks on the Senate floor, thanking the people of her state for giving her the "extraordinary opportunity" to serve them. Ayotte, who was New Hampshire's attorney general when she was elected to the Senate in 2010, was defeated in November by Democratic Gov. 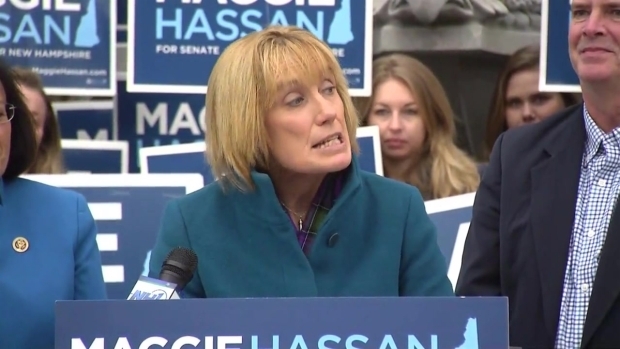 Maggie Hassan in a close race. "The people of our state are hardworking, caring, compassionate people with grit, and they have a fierce sense of independence, which I respect and admire. That spirit has guided me during my time here," she said in her speech live streamed on a Senate website. Ayotte, a member of the Senate Armed Services Committee, spoke about issues of importance to her, including improving services for veterans, restoring defense cuts, opposing plans to empty and close the Guantanamo Bay detention facility, and dealing with the "devastating epidemic" of heroin and prescription opioid abuse. Gov. Maggie Hassan declared victory Wednesday morning in New Hampshire's U.S. Senate race; NBC News' decision desk says the races is still too close to call. "I've met so many people in New Hampshire who are hurting because of this epidemic," she said. "Many of the families who have been affected have become my dear friends." She said they inspired her to work with Senate colleagues on an effort to get the Comprehensive Addiction and Recovery Act signed into law, a framework to address prevention, treatment, recovery and support for first responders. The tight race between Hassan and Ayotte was viewed as one of half a dozen contests around the country that would determine which party controls the Senate next year. The interest increased as Ayotte's complicated relationship with Republican nominee Donald Trump evolved. First, she said she supported Trump but wasn't endorsing him. Later, she said she "absolutely" would tell a child to aspire to be like him but quickly took back those remarks. A few days afterward, she rescinded her support altogether based on newly released 2005 recordings in which Trump bragged about using his fame to force himself on women. She wrote in vice presidential nominee Mike Pence's name, instead. On Wednesday, Ayotte spoke about the need for her colleagues to work together and put aside partisan differences. She spoke of why she ran for the Senate, her concern about the skyrocketing national debt. "On every committee I served on, we looked for ways to cut wasteful spending, and fought to hold the government accountable for the way it spends our hard-earned taxpayer dollars," she said. "It is my hope that this issue will be at the top of the agenda of the incoming Congress and the new administration." She received tributes from her colleagues from both parties for her work ethic, positive attitude and facing the challenges of juggling a Senate position with family responsibilities. Fellow New Hampshire Sen. Jeanne Shaheen, a Democrat, spoke of their teamwork on projects for the country and specifically for the state, including strengthening the Portsmouth Naval Shipyard and getting a new aerial refueling tanker. Republican Sen. John McCain of Arizona spoke of Ayotte's work on the Armed Services Committee in successfully fighting against the retirement of A-10 Warthog Air Force attack planes. "As the wife of a retired A-10 pilot who flew combat missions in Iraq, and an expert in defense policy, Senator Ayotte understood the critical role this aircraft plays in providing close air support for our fighting men and women," McCain said.